Independent sources confirm many of the major and minor characters of the Bible. Those melancholy words of the prophet Jeremiah were composed from the dismal confines of a dungeon cell. The prophet of God dictated the words of doom while his protege, the scribe Baruch ben Neriah, carefully recorded them on a scroll. Baruch read the words of Lamentations before the king of Judah, Jehoakim. The thought of losing his kingdom so angered the king that he cut the scroll into pieces and threw the scraps into a fire as though that would alter the divine decree. 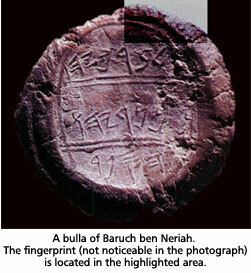 Twenty-four hundred years later, a small lump of clay was discovered in Jerusalem bearing the seal of Baruch ben Neriah. The disciple of Jeremiah was suddenly and tangibly brought to life. One's imagination began to run wild. Could this be the seal that was used to authenticate the original scroll of Lamentations? There is one thing the imagination does not have to conjure. When a document was to be authenticated and rendered tamper-proof, the document was rolled up and bound by a length of cord. The knot was encased in a small lump of clay, called a bulla, which was held steady with one hand while the other hand embossed the seal onto the clay. When the bulla dried, the document was ready for delivery. It was not unusual for the fingerprints of the person holding the clay and seal to be impressed onto the sides of the bulla. A thumbprint can be seen on the upper ridge of Baruch's bulla, most likely the print of Baruch himself. Sure enough! A thumbprint can be seen on the upper ridge of Baruch's bulla, most likely the print of Baruch himself. Once again the imagination begins to roam. Could there be any DNA residue of Baruch on the hardened clay? A large number of modern-day historians claim that there is no evidence that the events in the Biblical accounts from Moses, Joshua, David, through Jeremiah, and Baruch, and their successors actually happened. They claim that these leaders never existed, or that, at best, they were insignificant tribal chieftains who were later made into national heroes by writers who lived long after the alleged events. According to those historians, the events mentioned in the Bible were the products of the composer's imagination. The heroes and villains of the Biblical story were crafted for a people who desperately needed heroes and villains. Exactly who these crafty composers were, they do not say. Another point they do not address is how was it possible for these composers to one day suddenly present to the masses their supposed history, one of which they were previously totally unaware, is beyond explanation. The creditability of this history had to have been based on the reputation of the composer or composers, composers about whom we know nothing. However, modern-day anti-Biblicists would rather embrace the idea that the story of Joshua, David, Solomon and their successors where mythical tales concocted by obscure writers rather than yield to the possibility that the stories are true. It was not that long ago that there was no independent outside verification for hardly any of the Biblical characters. Nowadays, almost on a yearly basis, some independent source confirms the existence of one of the Biblical characters. Below is an impressive list of 61 Biblical persons, some are kings, some are prophets, some are heroes while others are enemies. They are central characters as well as minor players whose reality can be verified by archaeological and historical evidence. The name of the individual has been found in some extra-Biblical record or on some piece of archaeological evidence, such as a bulla or seal. The name must in some way be connected to the person named in the Biblical story. For example, the name Ahab being found on a seal would mean very little. However, if the seal read Ahab, King of Israel, that would mean a great deal. The chronological context of the name found must match the chronology of the Biblical story. If the above "Ahab, King of Israel" seal was found in an archaeological stratum dating to the 12th century BCE, that would create a major problem. The Biblical Ahab lived many centuries later. When all three factors have been met, according to the interpretation of recognized scholars, historians, and archaeologists, only then is the evidence conclusive. The verification of the more obscure Biblical characters is the more astonishing. To my mind, it is not the verification of the major personalities that is so impressive but rather the verification of the more obscure Biblical characters is the more astonishing. It could be argued that the Biblical stories were crafted around real kings and actual prophets who had lived and ruled in some bygone era. The names of these kings and prophets may have been retained in the conscious memory of the Biblical composers. They merely had to invent the stories, many of which were not at all complimentary to the audience to which they sought to appeal- something unheard of in the ancient world but has gained great popularity in our times. The Biblical composers would have found it necessary to add in a whole bevy of minor characters to make the story flow. These insignificant folks were totally fabricated by the composers. So goes the theory. When outside confirmation of the minor characters surfaces, it lends great strength to those who firmly believe in the veracity and accuracy of the Biblical narrative. Ahab (I Kings 16-22; II Kings 1,3-10; II Chronicles 19.21.22, etc) infamous king of Israel. Azariah/Uzziah (II Kings 14,15) king of Judah. Azariah son of Hilkiah (Ezra 7; I Chronicles 5) grandfather of Ezra, high priest. *Baalis (Jeremiah 40) king of Ammon. *Baruch ben Neriah (Jeremiah 32,36,43,45) a scribe, a disciple of the prophet Jeremiah. Belshazzar (Daniel 5,7,8) king of Babylon. Ben-hadad III (II Kings 13) king of Aram, son of Hazael. Esarhaddon (II Kings 19, Isaiah 37, Ezra 4) Assyrian king , son of Nebucadnezer. *Ethbaal (I Kings 16) king of Sidon. *Gemariahu the son of Shaphan (Jeremiah 29,36) servant of king Jehoiakim. Hazael (I Kings 19; II Kings 8,9,10,12,13) king of Aram, enemy of Israel. Renown king of Judah. Hezekiah was unsuccessfully besieged in Jerusalem by Sennecherib. Hezion (II Kings 15) king of Aram. *Hilkiah (II Kings 22,23; Jeremiah 1,29; Ezra 7; Nechemiah 11,12; II Chronicles 34,35) a high priest, contemporary of Jeremiah. Hiram (II Samuel 5; I Kings 5,7.9.10) king of Tyre, contemporary of Solomon. *Hopra (Jeremiah 44) king of Egypt. Hoshea (II Kings 15,17,18) last king of Israel. Jehoash (II Kings 12-14) Israelite king. *Jehoiachin (II Kings 24,25; Jeremiah 52; II Chronicles 36). One of the last kings of Judah. Jehoram II (I Kings 22, II Kings 1,3,6,9,12; II Chronicles 17,21,22) king of Israel, son of Ahab. Jotham (II Kings 15,16; Isaiah 1,7; Hoshea 1; Micha 1; II Chronicles 26,27) King of Judah. *Jehucal the son of Shelemiah (Jeremiah 37) official in the court of Zedekiah. Jeroboam II (II Kings 9,10,13-15,17,23; Hoshea 1; Amos 7; II Chronicles 9-13) King of Israel. Jezebel (I Kings 16,18,21; II Kings 9) daughter of Ethbaal king of Sidon (Phoenicia), wife of king Ahab of Israel. Menachem (II Kings 15) Israelite king. Manasseh (II Kings 20,21,23,24; Jeremiah 9,15; II Chronicles 33,34) infamous king of Judah, son of Hezekiah. Merodach-baladan II (II Kings 20; Isaiah 39) king of Babylonia, on friendly terms with Hezekiah king of Judah. *Mesha (II Kings 3) king of Moab contemporary with Omri dynasty of Israel, waged war with Israel. Necho II (II Kings 23; Jeremiah 46, II Chronicles 35,36) Egyptian pharaoh during the final years of the Davidic monarchy in Judah. Well known pharaoh of the 26th Dynasty. Pekah (II Kings 15,16; Isaiah 7; II Chronicles 28) next to the last king of Israel. Rezin (II Kings 15,16; Isaiah 7,8,9, Ezra 2; Nechemia 7) Last Aramean king of Damascus, fought with Pekah king of Israel. *Samgarnebo (Jeremiah 39) high official serving in the court of Nebucadnezzar. Sargon II (Isaiah 20) king of Assyria. *Seraiah the son of Neriah, (Jeremiah 51) brother of Baruch ben Neriah. Shallum (II Kings 15) King of Israel. *Shaphan (II Kings 22,25; Jeremiah 26,29, 36,40,41,43; II Chronicles 34) contemporary of Jeremiah. *Shebna (II Kings 18,19; Isaiah 22,36,37) Servant (minister) of king Azariah. Called the "one over the house," referring to his position as the one in charge of the affairs of the house of the king. Engraving above a burial cave bears his name and the phrase, "The one over the house." 58 A seal also bears the engraving, "Shebna, servant of the king." Shishak (I Kings 11,14; II Chronicles 12) king of Egypt, invaded Canaan during reign of Rehoboam king of Judah. So (II Kings 17) king of Egypt, contemporary with Shalmaneser V of Babylon and Hoshea, last king of Israel. *Sanballat the Horonite (Nechemia 2-4,6,13) governor in Judah, contemporary of Nechemia. *Tirhakah (II Kings 19; Isaiah 37) Egyptian king, contemporary of Hezekiah king of Judah. Well known 25th Dynasty Egyptian pharaoh. *Tobiah the Ammonite (Nehemiah 2-4,6,7,13) antagonist of Ezra and Nehemiah. Zedekiah (II Kings 24,25; Jeremiah 1,21,24,27-29, 32,34,36-39,44.49.51.52 Nechemiah 10, I Chronicles 3, II Chronicles 36) last king of Judah, installed by Nebucadnesser. Zedekiah the son of Hananiah (Jeremiah 36) official in the court of king Jehoiakim of Judah. Rabbi Leibel Reznick has been a senior lecturer in Talmudic studies in Rockland County, New York for the past 25 years. He has authored three books (The Holy Temple Revisited, A Time to Weep, and The Mystery of Bar Kokhba) and over 100 magazine and newspaper articles on Jewish History, archaeology, and religious and social issues. As an archaeologist I must warn Rabbi Resnick and the readers that many consider the particular seal of Baruch ben Neriah to be a forgery from the antiquities market. The prevalence of forgeries even among museum and known private collections is so great that Prof Shmuel Ahituv, this year's Israel Prize winner, omitted personal seals from the second edition of his classic handbook on inscriptions. It is important to consult the current academic discussions of the reliability of individual finds. I must also note for the readers benefit, from my own experience in publicizing finds in the media and the press, and tracking stories as a journalist and as a researcher, that the facts, spin, and implications are generally misrepresented - I mean, more than often. As a rule there will be one or more errors, even if the find is not sensationalized or overblown. The study of archaeology and text relationships is extremely rewarding from an educational standpoint. Care must be taken to base the historical record on bonafide finds, especially as forgeries are getting better all the time. Bullas, steles and seals only appear when there is a CENTRAL STATE, ie when a king rules. It is only when you have a central administration that written contracts, religious texts and administrative documents are massively produced. So it makes perfect sense to see more writings after the united monarchy appears. During the period of the judges, few people know how to write and the alphabet was at its infancy (it was "invented" in the middle of the 2nd millenium) so dont expect to find written materials in the second half of the 2nd millenium in Israel/Canaan. And thank you Rabbi Leibel Reznick for this facinating article. Regarding Haim Levy's remarks: Jesus appears twice in Josephus (Antiquities 18.3.1 and 20.9.1), in Seutonius (Lives of the 12 Ceasars), and in Tacitus. Not to mention the early letters of Paul (Galatians, 1 and 2 Thess, 1 Corinthians) and James, all written within 20 years of his death and resurrection. It would have been bold indeed to write that soon about someone who did not exist, to people who could easily travel and check for themselves. See 1st Corinthians 15:3-8 especially. Christianity had many opponents, right from the beginning, but not even the most virulent ever attempted to suggest that Jesus did not exist. In 1 Samuel it says that Saul's armor was put in Ashtoreth's temple, yet 1 Chronicles says his head was in Dagon's temple. Another "clear" contradiction! oh wait! when Bethshan Tell was excavated they found the two temples connected by a short corridor, the Philistines had absorbed Ashtoreth into their pantheon and had a "dual purpose" temple. Archaeology can't prove spiritual assertions but it does confirm the historical accuracy and authenticity of the bible stories. Great article. Archaeology and Biblical texts are not necessarily congruent. The finding of a chariot wheel--or a pair of them--may merely mean that a chariot my have broken down on the shore and the wheel discarded, or a chariot had tried to cross for some other reason, perhaps at a low tide and didn't make it. Now if one found a cadre of chariots there...maybe. by the same token the existence of somebody called jesus who lived and died 2000 years ago can not be prooved by any outside source, even not the historians who lived in his own time and place. There really is no proof of the exodus, but that doesn't matter one whit. If someone were to prove it never happened, would I stop celebrating Pesach? Never. When the rabbis were debating whether an oven was kosher, did the streams really flow backwards? Unlikely. Does that diminish the power and even truthfulness of the midrash? Not at all. Did people think the Iliad wasn't important before Schleimann found Troy? Well, 2000 years of readers and listeners didn't think so. It still remains one of the most moving and important books ever. Is there proof that Cain and Able existed and that Cain killed Able? No, but it doesn't matter in the slightest. Sin crouches at the door, but you can be its master. That matters, and Judaism commands us to work on that every day, moving toward better treatment of siblings, parents, workers, and even the stranger in our midst. Would we not do that because archeological proof is lacking or ambiguous? Judaism is unique as a religion since it compels us to question and think about everything, even whether G-d has been just. What other religion has the imperfect patriarchs and matriarchs of Judasim, who force us to work toward perfection even though we know it can never be reached? You shall be holy. That matters. Historical and archeological proof of people and events can shed light on much, but not on the truths of the Tanakh, and if you demand it, you diminish Judaism. I know good and well that the Sea was split, but for any disbeliever, what were golden chariot wheels of the Pharoah Ramses II doing on the ocean floor where our anscestors walked? That should have been up here. Also, the statue of Tzafnas Paneach found in Egypt. Undeniable proof of Yosef/Joseph. During the Persian Gulf War they stumbled over a ruin in the dessert in Saudi Arabia. They later excavated it and found Abraham's tax records. Even he didn't escape the IRS of the day. As for Joshua, there was evidence about him and events described in the Tanach about him,in the forms of stone monuments (recently discovered)with inscriptions telling the stories (along with symbols that came from that era) that completely matched Tanch descriptions. Other such monuments that matched later eras as described in the Tanach have also been found. As for earlier, there are stone tablets written in Egyptian and other early hyeroglyphic languages describing events that occurred to the Hebrews that corroborate the Biblical accounts (Rosetta Stone is well known and there are others. See the writings of Rabbi Avigdor Miller). Similarly, though later, are Persian records of the accounts of Purim and so on. Personally I can't see the sense in picking and choosing. enough proof is otu there to believe it all, but actually I don't need all this to believe it all, as I do not doubt the veracity of the COMPLETE Torah divinely sent down to the entire Jewish nation at SInai. THat substantiates any other Tanach record, as far as I'm concerned. Still, this is all so exciting, as it helps us feel so connected to our past, and for me, increases my yearning for Geula. The thing I dream of as the ultimate archeological discovery is the contract between Avraham Avinu and the entire people of Cheis, who unanimously witnessed a transaction that sold Kiryas Arba to Avraham and his family forever. THat would be us, indisputably. Thanks for your detailed work! In a world where people mock anything biblical without even giving it a minute of study, an article like this is priceless! 1,000 thanks to Rabbi Reznick for the many hours he must have spent compiling this formidable and impressive list! But what about the Torah? We often see what we want to see and find what we want to find. We come with an agenda and then take any "evidence" we come across and run with it as a proof of our beliefs. To say that there is no historical or archeological evidence is not to say that a person did not exist or that an event did not take place. However, it does suggest that possibility the more unusual the person or the event. On the other hand, to find archeological evidence that a person existed is not evidence about anything more than that. Even though you might be able to establish that a person existed this is not to say that the Biblical accounts about that person are necessarily true or false. So...why get caught in a trap from which we have no escape? The Torah is full of truth on its own without any need to address history or archeology. Even a lifetime of Torah study will not begin to exhaust the truths in the Torah. Just as people with an ax to grind will incorrectly lump all the Bible together as 'just stories', so may those with proof of the Kings of Israel and their contemporaries, imply that stories of Joshua and Moses and earlier must also be just as accurate. This is a proff of the autenticity of the BIBLE. all these is a very solid argument , and i don´t know why didn´t mention the kumram findings, they are two thaousand years old.